I can’t tell you how excited I am that the X-Files is returning to TV this January! I had my doubts that we’d ever see them together again after I Want to Believe’s disappointing box office – though I didn’t think it was a bad movie. But I started to get my hopes up when I saw Gillian Anderson at Emerald City Comicon in 2013 where she said everyone was up for revisiting the series. But it takes more than desire to get these things made – like money. She was talking movies back then, but the current TV landscape has recently opened up to these types of reboots. Look at Arrested Development, Twin Peaks, and 24. 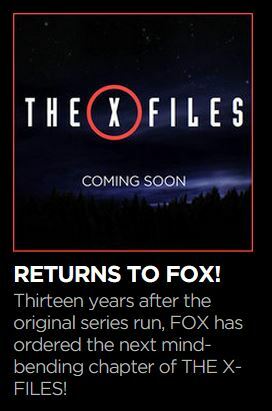 So when Anderson did the Nerdist podcast earlier this year with even more enthusiasm about bringing the show back to TV, and host Chris Hardwick pushed the #XFiles2015 social media campaign, I started to think it was really possible. I have a feeling the wheels were already turning at that point, but that didn’t make the official announcement any less thrilling. I caught this TV spot during the Wayward Pines season one finale last night and I’ll just say again that I’m very excited. Mulder, Scully, and…aliens! It looks like they’re returning to the “truth is out there” premise that hooked us all in the first place. Word even has it that the Lone Gunmen will also be returning. Can’t wait until January! The X-Files premieres Sunday January 24, 2016 on Fox.